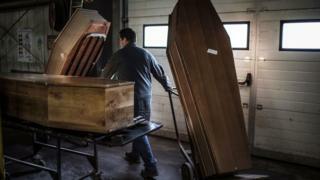 More than three times as many Britons want to be cremated as those wishing to be buried, a survey suggests. Of the 1,546 adults surveyed online by YouGov, 58% prefer cremation when they die, in comparison with 17% of those who would opt for burial. Of those in favour of cremation, 79% want their ashes to be scattered , and 7% want them to be kept. YouGov said there was a "strong shift in preference towards cremation as people get older". While 42% of 18 to 24-year-olds wish to be cremated, this figure rises to 71% among the over-65s. Statistics from the Cremation Society of Great Britain show 75% of people are cremated at present. When asked at which age they would prefer to die, the most popular choice was between 81 and 100, selected by 44%. This range was the most popular across all age groups, and most of all with those aged 65 and older - with 60% of them choosing it. The current average UK life expectancy, according to the World Bank, is 81. The highest age option - to live to 110 or older - was chosen by 14% of people. Of these, 19% of men wanted to reach 110 or older, compared with 9% of women. Freddie Sayers, editor-in-chief at YouGov said: "It's always interesting to see real numbers about something that people never really talk about. "I think these figures lift the lid on one of the great taboo subjects." He added that one of the conclusions that could perhaps be drawn from the poll was that as people got older attitudes to death changed, and rather than keep with tradition people were more inclined to think philosophically and practically. When asked if they were scared of death, 58% of men said they were not, compared with 42% of women. The research also probed the latest attitudes towards what mourners should wear at a funeral. Wearing black was seen as a requirement by 22% of people. But 45% said wearing other colours was acceptable, so long as they were "dark and sombre". Another 29% thought it was acceptable to wear any colour of clothing to a funeral.